One of Matt Kindt’s stellar “Mind MGMT” covers. What is the Mind Management organization? Who is Henry Lyme? What role does the journalist Meru play, if any, in the intrigue and smoke and mirrors of this clandestine group? 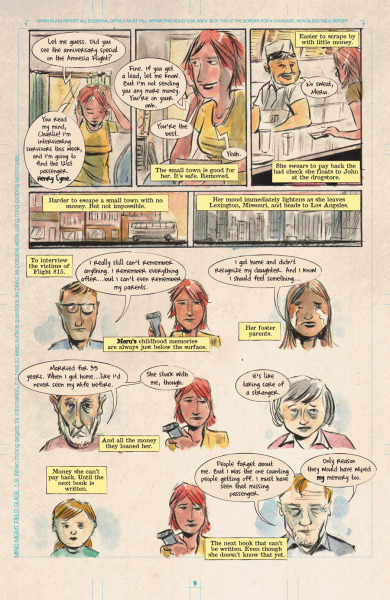 In the first volume of “Mind MGMT”, writer and artist extraordinaire Matt Kindt introduces us to a world of intrigue and mystery involving an agency that not only has (had?) its grip on a select group of people, but the entire world’s present and future in the palm of its hand. Kindt slowly weaves a rich tapestry of a story in these first seven issues of the series, with the reader just begging Kindt to reveal the truth behind the secrets. The use of pencils and watercolor bring a dreamy feeling of mystery and portents of doom. Although revelations, action, and spy-like shenanigans color the story, depth of character also shines through in a natural manner. Sympathetic characters and gorgeous art keep one enthralled during this curious tale, and lends proof that Kindt has created a world that is rich and sublime. Much cannot be written about the story, for fear of spoiling important information that is integral to this stupendous spy story. All one needs to know before entering this book is that a powerful secret agent of Mind Management named Henry Lyme is key to the mystery of the organization’s past and present. Meru, a journalist who is on a constant mission to find the truth, gets an earful from Lyme. Once she uncovers much of the truth, Meru’s transformation and growth is a natural occurrence that brings much depth to our “heroine”. Spy stories have been told before (even by Kindt himself), but none like this particular saga. Kindt is building a world where every character is given personal details and a backstory, no matter how seemingly minuscule (for now) their role may be to the overarching plot. One need only read the “Mind MGMT Case File” after each issue to prove the thought Kindt has put into each agent’s history. Not only does he instill pathos in his characters, but Kindt has each one of them play a role that is revisited in this volume and beyond. Next to Meru, Henry Lyme is the most important player in this adventure. When Lyme recounts his life story to Meru, the reader experiences, through Kindt’s words and art, the feelings of confusion, betrayal, and utter remorse that Lyme has lived through in the entirety of his life so far. These feelings are felt viscerally through Lyme’s facial expressions and body movement. In one harrowing flashback, Lyme holds a young girl tight while rescuing her from death and destruction that is coming at him from all sides. He seems to be running toward the reader and about to jump out of the page, making real what he has just recounted to Meru (and the reader). Every little stylistic tidbit in this yarn is a possible clue or integral addition to the overarching story that Kindt is unraveling before the reader. Storytelling touches add to the inventiveness that brims forth from the author’s imagination. Each page of the book is told on Mind MGMT “field report” paper, adding to a sense that one is forbidden to set eyes on the contents of its pages. This adds in the reader’s immersion into the story, as well as being a stylistic touch that is just one more element of the book’s ingenuity. The majority of the book has Mind MGMT Field Guide rules and regulations that run vertically along the left-hand side of each page. Some of these rules even add humor to the proceedings, as when one states that it may be possible “that the Field Guide text is all around us, on billboards and in prologues of popular novels” (with Damon Lindeloff supplying a prologue to this volume of “Mind MGMT”). At one point, the Field Guide rules begin to be cut off by some unknown personage butting in and spouting off warnings and pronouncements which could be directed at any agent within this book. A spy story on spy paper that is communicating with possible agents? Highly appropriate, this reviewer would say. 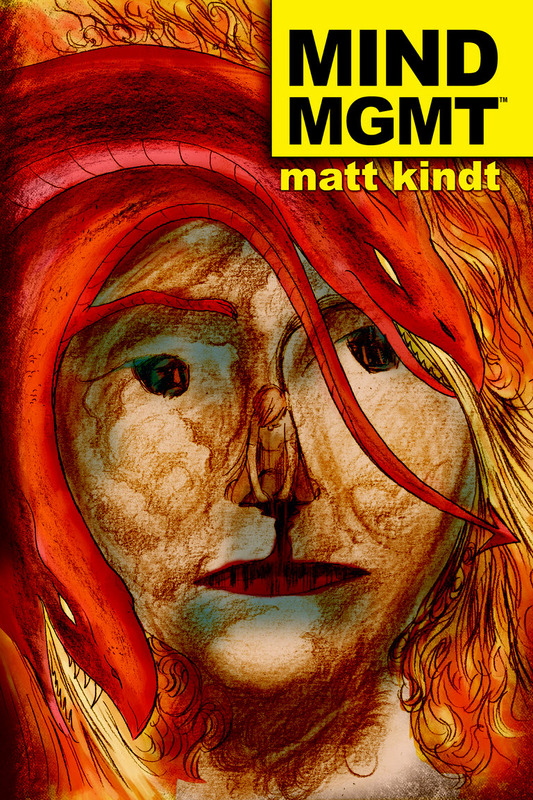 Kindt’s artistic touches add an atmosphere to “Mind MGMT” that contributes to the book’s sense of intrigue and mysteriously shadowy world that his characters reside within. On one particular page, three panels show a close-up of Lyme’s face as he talks to Meru, with each panel zooming closer and closer until it rests on Lyme’s eyes. Shadow covers his cheeks. One can’t help but notice that one of his eyes is green and the other is blue. But something odd is also of note: the color of each eye switches back and forth from each panel. What is the reasoning and mystery behind that artistic choice? In one of many majestic scenes, Meru is shown on a boat in China with a visage belying contemplation. At the bottom of that same page, the boat rides on a sea of black, with a jarringly red and imperfect watercolor sky adding even more intrigue. That imperfection adds to the otherworldly, “Twilight Zone”-like nature of this slowly unfolding epic story. 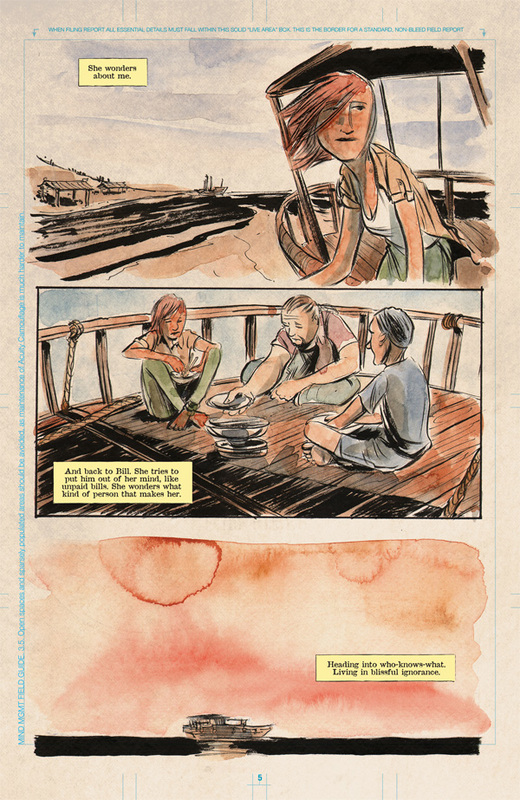 Kindt’s art may not be “perfect” or, in some readers’ eyes, “beautiful”. But, in it’s “imperfections”, the art is stunning and frankly breathtaking to this reviewer’s eyes. He has a style that is completely his own that is, in fact, beautiful. His art can seem rough and deceptively simple at times, yet is filled with enough ingenious details to warrant multiple readings. One simple page containing three panels encapsulates what Kindt has accomplished so far with this book: created three dimensional characters within an exciting and fantastical setting. In the first panel, Meru’s brow is furrowed, while her mouth and body language are tense and in a state of shock. Only the side of Lyme is shown, with him telling his story while Meru’s thoughts are in pink boxes. The next panel has Meru more relaxed now and holding her head as her eyes remain closed in shock. Lyme turns away and, though his eyes are behind sunglasses, a sense of shame radiates from his face and mouth. In the third and final panel, Meru glares down toward Lyme with contempt that burns off the page. A hesitant Lyme looks toward Meru, head bowed and beaten down by life. Characters live within this non-conventional spy story, not caricatures. Missions and mysteries may abound in “Mind MGMT” and within the organization itself, yet much more is yet to to be discovered and uncovered as Matt Kindt’s brilliant series continues on after this first awe-inspiring volume. With his pencils, watercolors, and exquisite skills as a writer, Kindt has built a world that will inspire, intrigue, and make one wish that they had created a place and characters that seem very much alive. What is Mind Management and who is Henry Lyme? The answers lie within “Mind MGMT”‘s superlative pages.